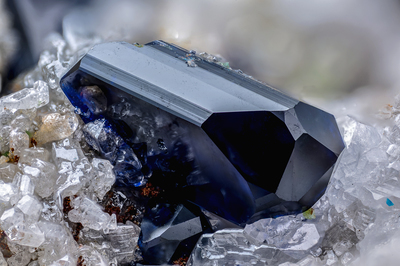 A monoclinic crystal, of the "prismatic" type, blue, of azurite, rich in shapes, resembling, but not coincident to the figure n ° 301, Band 5, Plate 73 of the Atlas der Krystallformen of azurite, also coming from Tsumeb and reported in Mindat under "Azurite". See, in particular, the small faces in the shape of a triangle. This azurite crystal is grown on small crystals, white, bright, of cerussite. Collection and photo of Gianfranco Ciccolini.